Everyone has a heroic steak inside of them. Sure, you might not have superpowers and you might not have a golden lasso of your own. You might not fight Ares on a regular basis and you may not ever get a chance to cruise around on an invisible jet, but really, that's not what Wonder Woman is about anyways. Wonder Woman is about sharing the ideals of love and compassion across the world. She's about standing up to injustice. She's about protecting the weak from the cruel and powerful, And those are some values that we can all adopt into our everyday life! In a way, we can all be heroes just like her! Perhaps you just need a reminder of her heroic values. This DC Wonder Woman sticker works as a great constant reminder of the ideals of your favorite comic book character. The front has her yellow, red, and blue symbol on it. The back has a layer of adhesive which allows you to stick it to most surfaces (it's not called a sticker for nothing!). The locations that you can place this sticker are limitless! Why, you can put on on your backpack, your skateboard, or your notebook. 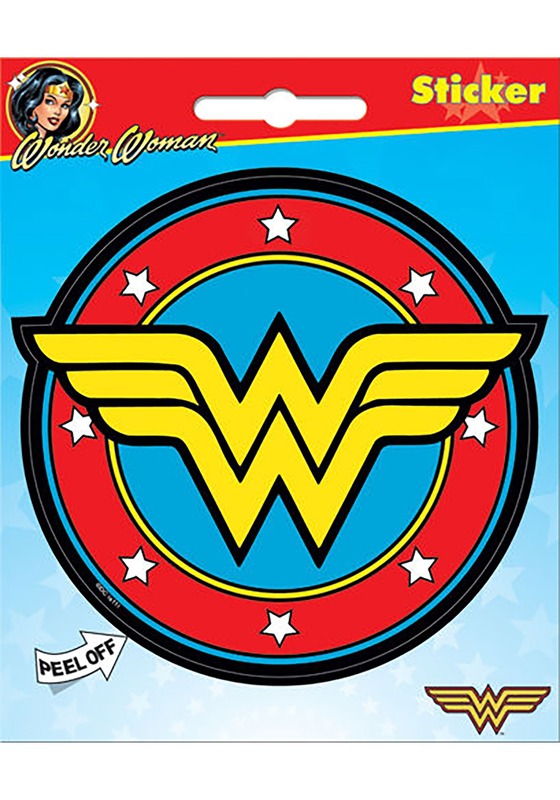 You can even place it on the side of your microwave if you think it needs a little bit of Wonder Woman attention added to it. Just make sure that wherever you place it, you can admire it every single day.